I hope you don’t mind, but I’m going to take a step away from talking about food today. It has been a while since I posted. I took some time to focus on other things. Some exciting work-related matters (watch this space), but mostly health and family issues. It gave me some time to reflect on a few things, one of which is friendship. Adulting is seriously hard. No one really prepares us for it. And parenting is even harder. Here we all are trying to drag ourselves through the ups and downs of life, teaching little people how to be in the world, while still trying to figure it all out for ourselves. Not an easy task. And the only thing that makes it all manageable is the connection we have with others… friendship. While I was dealing with some health issues, I really got to see what my friends are made of. Some brought meals over to help out when I was recovering. Others ubered cupcakes across town to cheer me up (aah, the wonders of the modern world). My doctor friend was always at the end of the phone to answer my crazy medical-anxiety questions. My new business partners sent beautiful flowers. And we had offers of help and support from all directions. 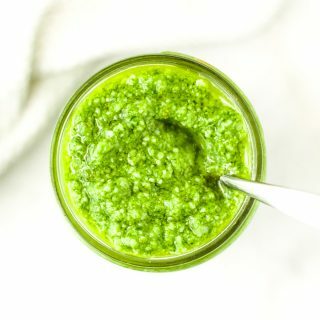 Even now that I am back to full health, my friends are still coming through with amazing things like this pesto recipe (thank you Paula)! So this post is a thank you to all of my friends. No matter where you are or how often we are able to see each other, I appreciate every one of you. And seriously, this pesto is truly delicious. I highly recommend that you go and make some for one of the special people in your life. 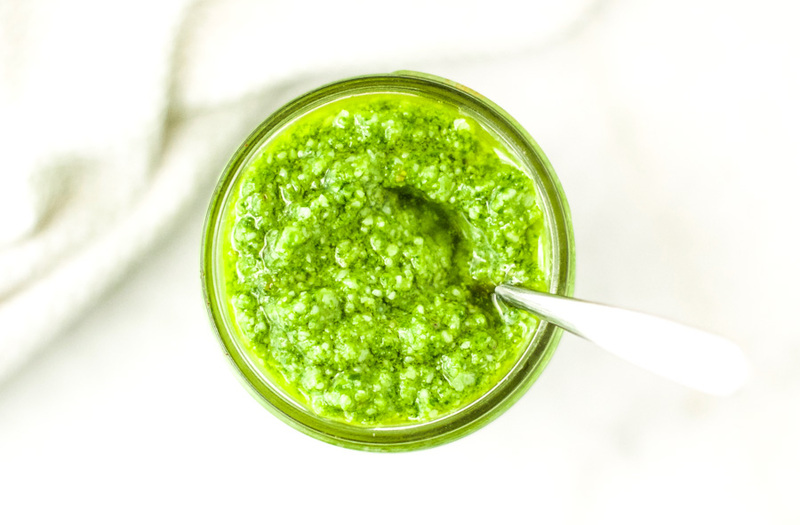 This 5-minute pesto is incredibly easy to make and so delicious that you might want to eat it all with a spoon. Careful! 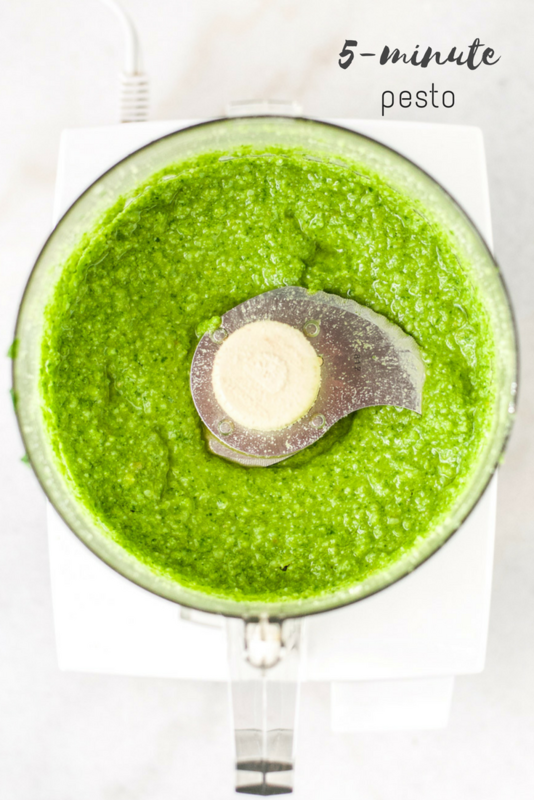 Put the basil, pine nuts, and garlic in a food processor and blend until fine. Slowly add the olive oil while blending. Add the parmesan and blend until just combined. Store in a jar in the fridge to use in sandwiches, on roasted vegetables, with pasta or brown rice, or any other delicious way you can think of. Great piece Esther! Thanks for sharing your thoughts and wisdom on the two things that truly matter in this life – great food and nourishing love! That’s a very lovely post Esther and along the lines of what I did last night really – say thank you to very good friends. The ones who have really supported me during this last year. As I said earlier, not always the ones I would have expected to count on but they are the true friends. Others I would have thought were true friends weren’t there when I really needed them. Perhaps we are sent these trying times so we can find out who our real friends are. 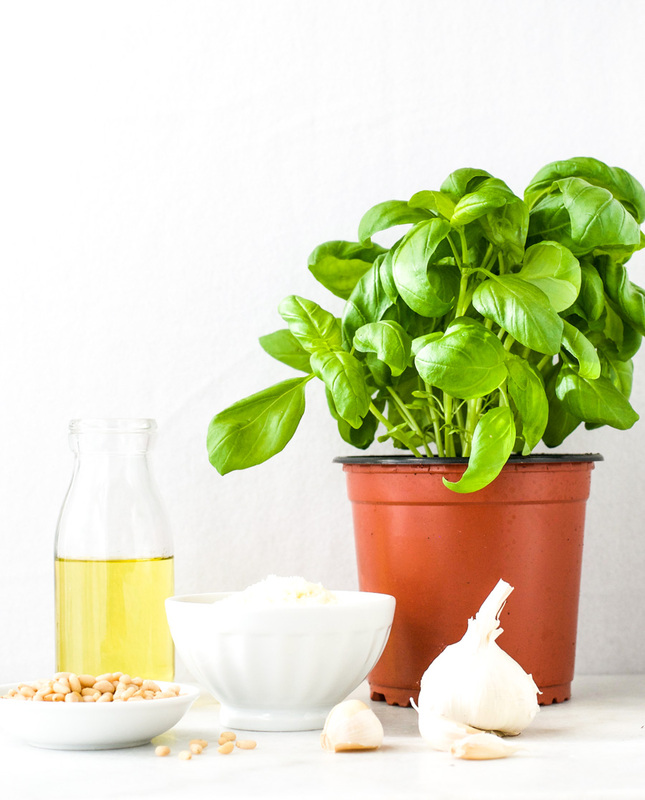 Hi Esther, I’m so sorry to hear that you’ve not been well but very glad to hear you are on the mend now and it sounds like you’ve had some excellent support x And that pesto looks awesome, anything ready in 5 minutes is a winner!